Day hikers are most vulnerable in survival situations (National Geographic article). 2/27/2019: You don't have to go far from home for adventure and beauty. These scenes are within a one-mile radius of my house. 2/13/2019: On Haystack, we found sun and solitude off of the Art Smith Trail in the Santa Rosa and San Jacinto Mountains National Monument, a spectacular view of Southern California's mountain ranges, and our old summit register entry from 2011. Mt. 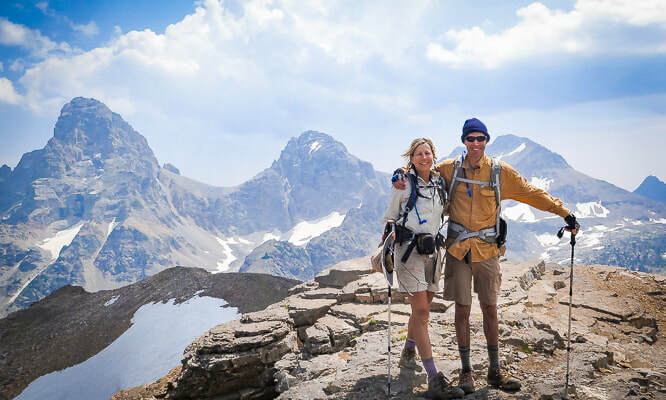 Heinen - Boise Mountains - Grand Slam Peaks Completed! ​12/30/2018: The reward for the long walk across Pinto Basin followed by a rocky climb is the outstanding 360° views of the Mojave desert mountain ranges and the bright red barrel cacti that stand out in contrast. And, there's a sculpture on the summit! 11/30/18: Canaan Mountain, a towering plateau of Navajo Sandstone is a classic southern Utah adventure through red sand, forested canyons and over ancient sand dune slickrock. Located south of Zion National Park, it is wild and beautiful. 10/29/18: The sudden jaw-dropping, in-your-face view of the GrandTeton Mountain Range as you crest Table Mountain is worth the 4,000-foot gain; it's a view you will never forget! 9/22/18: Spectacular adventure with beautiful scenery throughout, this is a tough hike/scramble to the second highest mountain in the rugged Pioneers with a breathtaking view and steep drop-offs at your feet. 9/3/18: Hike the remote cross-country route of the last mule U.S. mail delivery in the Phipps Death Hollow Wilderness Study Area through slickrock sandstone and sagebrush flats. ​Mt. Heinen - Grand Slam Peaks Completed! ​6/5/2018: This superb steep ridge hike out of Arrowrock Reservoir in the Boise Mountains treks through blankets of wildflowers and provides an exhilarating view of water and mountain ranges. It's our final "Grand Slam Peak". ​A challenging, uncrowded hike with open views through native bunch grasses, Ponderosa Pines and wildflowers, and smooth Arrowrock Reservoir at your feet. The four Grand Slam Peaks are Lucky Peak, Cervidae Peak, Mt. Heinen and Kepros Mountain - all located in the Boise National Forest. 5/6/2018: A spacious ridge ramble in the Danskin Mountains with abundant wildflowers and views of snow-covered Trinity Mountains and Arrowrock Reservoir​. Peak #3 of the Grand Slam Peaks. Take a solitary and refreshing walk along a lush and undisturbed landscape close to Boise. Trail begins at Blacks Creek Road summit on a steep single-track motorcycle trail with some steep ascents and descents, then meets with a jeep trail that ends at the summit of Kepros Mountain. ​April 23, 2018: A rugged and beautiful off-trail trek up Breakfast Ridge in the Pusch Ridge Wilderness through a saguaro, palo verde and ocotillo "forest". ​Abandon a well-trodden trail for the superlative experience of exploring a "remote" and wild route-finding trek on a relatively easy-to-travel ridge between Breakfast Canyon and Rattlesnake Canyon out of Sabino Canyon Visitor Center. Sweeping views of Tucson to the south with expansive views of rugged crags and peaks to the north; deep canyons drop off on either side. 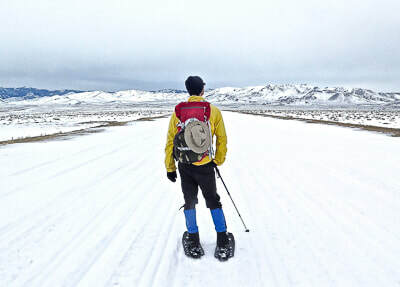 March 26, 2018: Snowshoe climb to Lucky Peak in Boise River Wilderness Management Area after a March snowstorm. A steady breeze from the northwest provided a good headwind for most of the climb. On our way down, the clouds broke revealing a spectacular winter scene with views of the Boise National Forest to the northeast, Lucky Peak Lake to the southeast, and the Owyhee Mountain range to the south. March 16, 2018: Short and steep ridge hike close to Boise overlooking Lucky Peak Reservoir to a summit with great views, Boise National Forest. 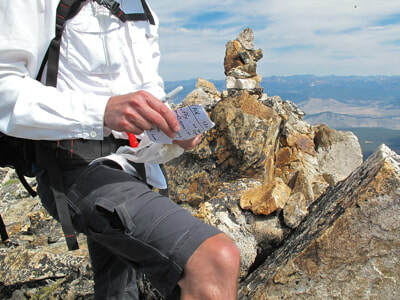 Cervidae Peak is one of the 4 "Grand Slam Peaks" that Tom Lopez, author of Idaho: A Climbing Guide describes. 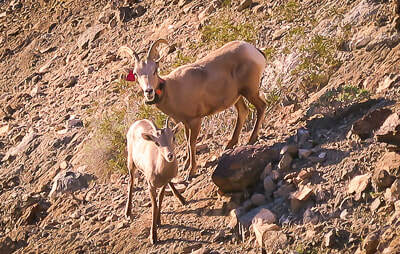 Fred and I use Cervidae and Lucky Peak to train for our summer mountain summit hikes. 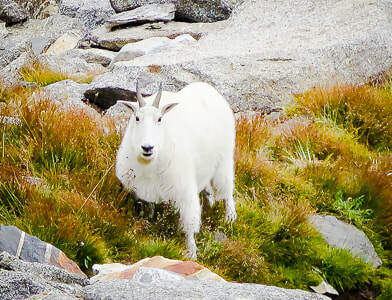 We discovered Cervidae when we wanted to add variety to our usual Lucky Peak training. February 20, 2018: Cross-country hike to summit of Monument Mountain in Joshua Tree National Park, and some of the oldest rocks in California. "Mind expanding" is what designer Jonathan Adler calls Joshua Tree. For those who have traveled deserts in Southern California, hiked the dry washes, climbed rust-red and brown rocks and seen valleys that extend nearly to the horizon backed by mountain ranges, Joshua Tree is a special place. It's a sublime and expansive wonderland. January 17, 2018: Roger Keezer, Coachella Valley Hiking Club hike leader, Search and Rescue Volunteer for Riverside County Sheriff, and great friend conceived the phrase, "Cactus to Clouds", a now well-known extreme hike. Fred and I hiked to his memorial in the San Jacinto Mountains with Maria Keezer. ​December 11, 2017: Beautiful riparian vegetation along a rushing creek and a breezy Ponderosa pine forest can be experienced just a few minutes from downtown Boise. October 28, 2017: Taylor Creek Trail to Double Arch Alcove contains a treasure-trove of exposed geologic features in a relatively short distance. 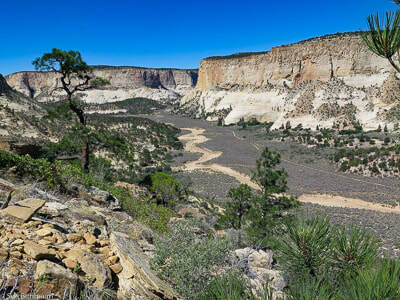 The towering wall seen from the north side of the canyon is Tucupit Point, and the wall seen from the south side is Paria Point. The hike ends at the alcove carved into Navajo Sandstone. ​Utah - The Cowbell and the Cryptobionic "Highway"
October 29, 2017: Singletrack cruisin' at Hurricane Rim Trails near St. George and hittin' the bell. September 23, 2017: A September snowstorm changed our plans for summiting Norton Peak, but the stunning scene at Miner Lake was worth the trek in the snow. ​August 8, 2017: 4 - day backpacking trip to Alpine Lake, Upper Redfish Lakes, Lake Kathryn and Baron Lakes​​. ​ February 11, 2017: Our attempt to snowshoe into the mining ghost town of Silver City, Idaho this past winter. 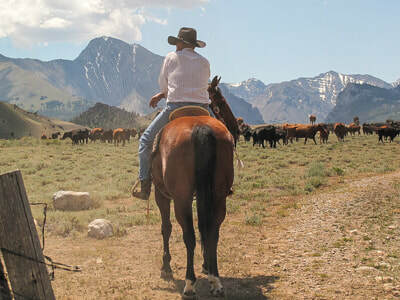 And...how does the Owyhee Mountain Range get its name? 2013: If you don't mind steep drop-offs and want to witness an incredible view of Zion Canyon, this hike's for you! 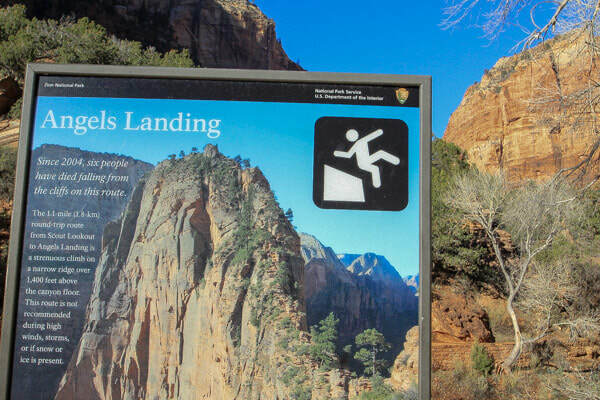 If you don't mind steep drop-offs and want to witness an incredible view of Zion Canyon, this hike's for you! The Habitat Restoration page lists organizations that welcome volunteers for various land care and restoration activities.